Talk to Happy Fun Time Live at Unpub 9 about Cookie Bandit, Real World Mechanics, and how pitching game designs has changed for game designers in the last few years. The real world is fun. The real world contains a variety of ways to make strategic choices, dare I say game mechanics. These mechanics are games, but a lot of people do not realize they are games. If you sit a person down and try to teach them the concepts, they may think it’s too complicated, or get board and not pay attention. But if I sit that person down at a board game, teach them some rules with a win condition, they'll pick it up quickly, and may even find their good at it. Odds are decent, they already have developed skills to utilize the mechanic because they unknowing use it already in their everyday life. What does a real world mechanic look like? Let’s say you wanted to make a game about building a treehouse using Real World Mechanics. A real world mechanic would focus on the physical actions taken to build a treehouse, say hammering a nail in a 2x4. While building a treehouse is a wonderful theme, the mechanic of hammering a nail into wood does not excite me. Notice that when talking about Real World Mechanics I focus on the experience of building a treehouse, not the excitement of having a treehouse. I am bringing strategic decisions from the real world into a game, not necessarily the theme that goes with those decisions. Inspiration for Real World Mechanics can come from any process. And there are fields of study devoted to translating human behavior in the world, like economics, and political science, which I conveniently like to steal from to make board games. The key thing I look for are processes in the real world where people make strategic choices with other people and porting that experience into a board game. So what is an example of a real world mechanics I want in a board game. Here is one, mortgage backed securities. Wait, stop running away and hear me out. I have strategic information telling me who will survive and who will be swept away. I want to use that information to ensure I am the one who survives and others are left holding the bag when things come tumbling down. That is a tense, exciting, and competitive situation, which also happens to be a mortgage back security. As I said earlier, my goal is to provide players the experience of the real world mechanic, not necessarily the theme. I could have designed a game themed about mortgage backed securities, but instead I themed a game as life in the mob. In New Jersey Syndicate you carefully place your goons in cities. Goons placed earlier in the city are less likely to be picked up by the FBI than goons played later in a city. Players are scouting the riskiness of each city while trying not to give away their inside knowledge on risk to their competitors in an effort to gain a competitive edge. 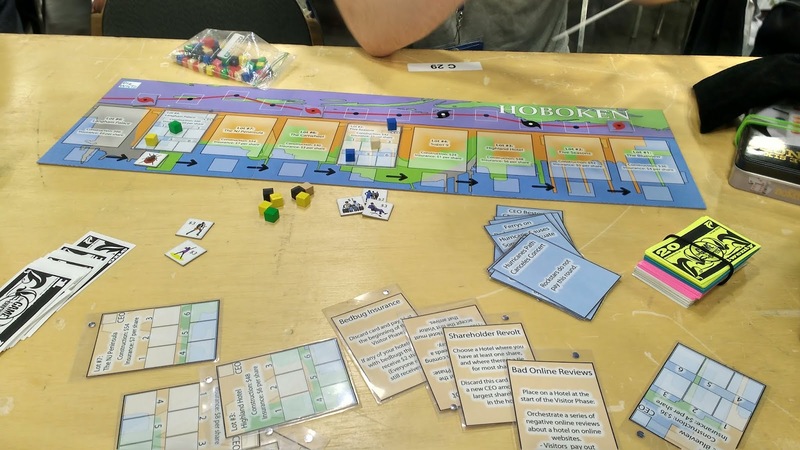 Eventually, the game comes to a climatic end where players learn if they made a sound strategic placement of their goons or if the FBI is sweeping up all their goons, blocking them from becoming the new Don of the New Jersey Syndicate. No where do players think they are partaking in a game of mortgage back securities. New Jersey Syndicate lets the players experiencing the excitement that takes place within the mortgage back securities market without ever learning about the intricacies of the mortgage back security market. 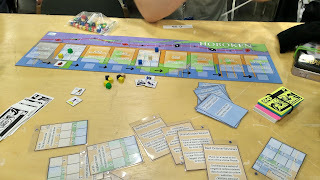 More importantly, porting a real world mechanic into the game enables me to provide players with a fun new game experience they have not seen in other board games. In the eleventh episode we talk about the Prisoner's Dilemma in board games. Highlights include a discussion on different ways Paul's wife will prevent him from ever ratting her out to the police, multiple ways of escaping the Prisoner's Dilemma within a game, and how repeatedly paying games with a group of people creates an opportunity to escape the Prisoner's Dilemma within board games. Note: Aaron misspoke when he said gambling is not a zero sum game. Aaron was trying to emphasise that games with gambling can provide a marginal benefit or loss that changes player behavior when compare with games where either a player just wins or loses (e.g. a 12 run win and a 1 run win in baseball is still one game win). In the tenth episode we talk about how strategic action - in essence the art of creditable threats or promises to deter or compel other players to alter their actions within a board game. Highlights include a discussion on how to apply these tactics to Setters of Catan and the question whether or not people what to play games with players who are good at using these tactics. In the ninth episode we talk about how players respond to uncertainty and information within games. Highlights include a discussion on the benefits of holding asymmetric information and tactics to counter your opponent's information edge. Can players provide a creditable signal in your game or is everything just cheap talk.